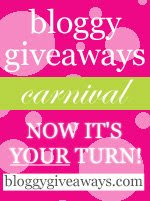 Last year I missed participating in the Bloggy Giveaways Carnival so I thought I'd give it a go this year. There's a lot of fun stuff being given away over there so go check it out! Because I want to participate in the giving department (as well as hopefully the winning department!) I'll do a giveaway myself. Because I'm all about finding quiet time alone to read a good book, you can also win a $5 gift certificate to Starbucks so that you can enjoy the drink of your choice, while enjoying this quick and fun read. You know the ropes! Leave a comment indicating you'd like to win. Must have a U.S. mailing address in order to win. Please also leave some information in your comment as to how I can contact you, should you be the winner! P.S. As per all the other contests and giveaways, this one also ends on Friday night, August 1st. I would love to win--books and coffee, what a great combination! Awesome idea and a great combo! email if I win at sacredmpp @ gmail . com! Neat idea! I have a Starbucks in walking distance (I know! ), but I haven't taken advantage of it yet. Great idea! coffee and book = perfect! okay...so I drink hot cocoa while I read........count me in! Thanks! I've never read Wodehouse, but I'm always looking for new authors--thanks for entering me! reading and (decaf) coffee - sounds like a great break before baby #2 arrives! Coffee and Wodehouse? Sounds good. I've been wanting to read Wodehouse for several months. I *adore* Wodehouse. I pull out my Jeeves Omnibus for comfort when sick in bed! love Wodehouse, but haven't read this one! Jeeves and a cinnamon doce latte...I'll be crossing my fingers on this one! great prize! As a sahm...I've had to find some "mommy time" and i do this by reading..and who doesnt love starbucks???? A book and a treat, PERFECT!! I love Wodehouse and Starbucks, did you design this giveaway for me? :) Thanks for the chance to win! This author would be new to me. I'd sure like to win. Thanks! A book and Starbucks! Great combo! Sounds wonderful! I'm a bookworm and a coffee lover..this is great! What about good dirty fun? :P I've never read Wodehouse, but have certainly heard of him (her?). Thanks for the chance to win. Love coffee! And I've never read any Wodehouse either. Tea and a new book are two of my favorite things! Thanks for hosting! wait! a new book and coffee?! that's heaven!!!! Oooh! I'm game. :) Count me in. I might even give it a go msyelf (post my own giveaway) next time around. I'll have to find out more. I would love to win! My daughter says I don't read enough. Oooooh, now I really want some coffe - a nice triple venti toffeenut latte! I'm always looking for new reading material! Great giveaway! Thank you I'm all over a new book and coffee! Well...even if I don't win this, it's going on my growing list of must-reads. Thank you so much! I'd love to win. Books and coffee are two of my favorite things! I love Wodehouse, but haven't read this one. Just some of the Jeeves and Wooster books. Love Starbucks too, so hope I win. What a terrific combo, although I'm liable to spill the coffee if I'm reading Wodehouse, he's so hilarious. :) I own a lot of his books, but not this one. Can't wait to read this book . . . and of course coffee . . . hope I win! A good book and starbucks??? Oh my heart, be still....of course I'd love to receive a gift like this!!! OK, Carrie. I love Wodehouse, and my kids love Starbucks. I need a good book to read and who doesn't love Starbucks. I LOVE Wodehouse. What a fun giveaway. I love reading and I love Starbucks! Best of all, I have never read Wodehouse but after reading your glowing recommendation, I definitely will now! This is what I'm giving away too! Who knows, maybe we'll each win each other's gift card :). Books and coffee go so well together! I've never read Wodehouse, but would like to since you recommend him so strongly! And I've love to read him with a grande caramel frappucino!! I am all for quiet reading time with a good drink at hand. I have never read Wodehouse, but with such a high recommendation, I would love to give one a try. I love to read but have never read any Wodehouse, sounds great! I'm a big reader and would love to win. Mmm Starbucks and a new book. What a great day off that will make! I love Wodehouse, but I don't think I've read that one. Actually, that's a good idea...I really enjoy listening to Wodehouse on CD and we're going on a car trip next week. I should see if I can find a copy at my library! I've never read Wodehouse, so I would love to win! And who doesn't love Starbucks? Thanks for leaving a comment on my giveaway post! Good luck! I've never read Wodehouse. Help me! I have not heard of him, but a good, clean book is always welcome! I enjoy finding new authors to love. The Starbucks, however, would be used to bribe my dd to do things I don't like doing, lol. She's addicted. I've never read Wodehouse, but I've watched Jeeves and Wooster and would love to read his stuff in bookform! I've never read Wodehouse but I'm always willing to give a new author a try. Thanks! Awesome. There is nothing better than a cup of coffee and a good book. I love reading and I love coffee! Thanks for the giveaway! I love reading and I love Starbucks Caramel Macchiatos! Thank you for the giveaway! A book and coffee what a great giveaway. thank you. I love the simple things...a book and coffee sound divine! Nothing beats a good read ...except a Starbucks GC that goes with it. What a great giveway! I would love to win! My contact info is in my profile. A good book and good coffee. Great combination! My email is on my profile page. I love Wodehouse, but I have never read this book. I would love to own it. Sounds yummy and I love to read!! I've never even heard of him! I feel out of the loop now... Pull me back in, please! Starbucks and a good book, does life get any better? I'd like to win, fun prize! Wow thank you for the great combo. Its fun to go to starbucks and curl up and read a book with some coffee. Coffee and a good book make a perfect combo! Thanks for the giveaway! Coffee and a good book??? WOW! I've never read any Wodehouse but it sounds good to me. Can't go wrong with a new book and a warm coffee! i'm always up for a good read...esp. now. i need a great escape from the grind, and a good book to sink my teeth into sounds perfect. oh, and starbucks. yes, please! Great combo, starbucks and a book! Ooooh! Count me in. Coffee and a book (sans kids) sounds wonderful! Thanks for the great giveaway! I have never read this author but I would like to now! I have not read any of this author but you have made it sound very interesting. Thanks. Never heard of Wodehouse, but I like to read good clean books. I'll go for it. And coupling that with a Starbucks GC...great idea. You had a great idea, and I hope to win it. Starbucks!and a book.. be still my beating heart! lol, So you supply the book, the coffee, and what about some good company to share what I am reading? I am a huge reader but I have never read a Wodehouse novel! No reason I just never got around to it. But I know a lot of people love the books so I would love to give it a try. Thanks for hosting this giveaway. I would love to "check" this book out! A good book AND a good cup of coffee. *swoon* I think I'm in love! This would make a wonderful just-because gift for my husband -- P.G. Wodehouse and Starbucks are two of his favorite things! A good book and Starbucks? A perfect match. I've never read Wodehouse, would love to check it out. Never read him but would love to! Coffee and a good book is divine! I've never read a book by Wodehouse but I'm always game to try a new-to-me author - in fact one of my favorite places at the bookstore is the new author rack! Oh a book AND coffee - how can a girl go wrong! Thanks for entering my giveaway - if I win my email is on my blog! Never read these books either, thanks for the chance! Thank goodness my Starbucks isn't closing. I could use some time alone reading with a vanilla latte. Thanks so much. A book and coffee - the perfect combo! where do i sign? lol. i haven't had any alone time since my little was born 9 months ago! I wanted to try reading something by Wodehouse. Great giveaway! I love to read, and this book sounds great! I love to read too! I haven't heard of Wodehouse, though. But, that could be because I am mostly reading YA. Never read any Wodehouse but sounds like fun.Thanks katie_mmartin at yahoo dot com. I haven't read Wodehouse, but I'm willing to start now! thanks & have a great week! I love being introduced to new authors and books, thanks! I could use some ligthearted reading! The last two books I read made me cry. ... Not that they were meant to be sad books, but in one of them a dog died and... ever since Where the Red Fern Grows, I can't handle dogs dying in books. Would love to try a new author out! A book and coffee? I'm in! i do need some quiet time alone and this would be perfect! Sounds great! Coffee & a good book--heaven!! Always looking for a good book! And well, coffee just goes w/o saying! That's a very relaxing combination right there. I can't wait to reading a Wodehouse. P.G. Wodehouse is my favorite comic author. Thanks for the chance to win! I've never read Wodehouse!!! Does that make me weird...lol! I'm from Seattle, a book and a coffee are all I need! Thanks for the contest! Never read this author! I'm always up for new books, though, and yes, coffee! I haven't read any Wodehouse and I don't know why! I should probably start. Oh, I like this prize! Thanks for the giveaway! I've never heard of Wodehouse either...but I like the sound of it, with Starbucks as well, woohoo! Book and coffee, sound good to me! You would give me a much needed relaxing day off! A good book and coffee - it just doesn't get much better than that! Here's hoping I win! I love Wodehouse. But I haven't read this one. I don't believe I've ever read him. What a perfect prize, a good book and a cup of tea. Always looking for a good book--what better place to read it at than Starbuck? Thanks! Books and Starbucks are my two favorite things...You rock! I adore Wodehouse! Thank you for offering this. Ooh, new author to check out, thanks for the recommendation. Starbucks is never wrong. Great giveaway, thanks. Check out my $50 Amazon GC and Back to School Giveaways if you get a chance. Got any chocolate to go with that coffee and book? That's OK I'll bring my own . . . Yes books and coffee are a great prize! I am going to need some relaxing, quite time during our move. We are moving cross country in 4 weeks, actually we are driving ourselves and our many pets 1500 miles while the movers handle our things. We plan to stop at starbucks along the way and having a gift card would sure help out in paying for some liquid crack (aka starbucks)! We can't live without our coffee! I've never read Wodehouse, but I'm open to it! And I ADORE Starbucks so this would be great! Great giveaway! Thanks for offering it! I have never even heard of the book Wodehouse but from your description I it is a must rea and what better way to steal some private time other than at a Starbucks. Thnak-you for the contest. books and coffee , what's better?? Do you know someone else also told me the same thing about Wodehouse! Doesn't get any better than coffee and a good book! Thank you for the giveaway! The Bux and a Book. Sounds like my kind of afternoon! I've never read Wodehouse, sounds intriguing! This would be so great, I love witty, funny books (not to mention Starbucks!) Thank you! I hope to win this for my wife, thanks for having the contest. She reads everynight and the Starbucks well thats for me. books and Starbucks! It can't get much better than that! Holy moley, roly poly! This is amazing! irrelevantheart (AT) gmail (DOT) com! Thank you! I read one of the Jeeves books a while back because Wodehouse keeps coming up as an influence on some of my favorite authors. Very fun, and I second the recommendation. Would love to win, thanks! Books and coffee-the perfect combo! P.G. Wodehouse AND coffee? You are clearly a person who knows what's what.